Description: Featured image is a mock magazine cover titled Blind Beauty. Closeup of Maribel on the cover smiling for the camera, in black crew neck top and multi-colored beaded necklace, her long hair cascading over her shoulders while she stands in front of a blue painting. Happy Friday! I hope everyone has just about completed their Christmas lists and are faring well during these last two frenzied weeks leading up to the holiday. Personally, with the exception of items purchased online I typically wait until a day or two before Christmas before venturing out into the madness. It’s not so much the procrastination thing that propels me as opposed to my distaste for mob scenes (which is one reason online shopping is tailor-made for someone like me). Lately I’ve been experiencing some non-holiday related stress mainly due to my laptop. Last year I had similar issues where it would just shut down and of course it was always during the most inopportune times. After troubleshooting several things a laptop cooling fan was the solution. I suppose that adding an additional year to the life <sniff> of my ‘puter is something to be celebrated but why, oh why does it hurt so bad? Unfortunately one of my most critical tasks revolves around finding a replacement laptop. I hate computer shopping almost as much as I hated car shopping (thank goodness looking for vehicles was removed from my list five years ago). See, there are a few positives to vision loss) but I’m getting off topic. Let’s just hope my machine will cooperate with me to get this post published before Christmas. A few weeks ago I reflected on this past year of blogging and in particular the women featured during Fierce Fridays. So I’ve been sporadically contacting these amazing women so that I could publish several year-in-review articles on what’s happened in their lives since I last wrote about them. Today it gives me pleasure to present Amy Bovaird, Kerry Kijewski and Maribel Steel. Amy Bovaird’s book Mobility Matters: Stepping Out in Faith was published in October of this year and I’m so happy to let you know that the large print version is available now, just in time for Christmas. At the time of this post Amy is also in the process of making an audio version of the book that I cannot wait to snap up. The newest book Amy is working on, A Sight for Sore Eyes: The Lighter Side to Facing Vision Loss, will allow us to glimpse into the humorous side of her everyday life as seen through her vision-impaired sight. If this book has stories on the level of what she shared in Mobility Matters it is bound to be a hoot. To buy a paperback copy of Mobility Matters: Stepping Out in Faith on Amazon click HERE. The Kindle version of the book is free for Amazon subscribers and costs $3.99 for non-subscribers. For more information on Amy you can visit her site at amybovaird.com and follow her on Facebook at Amy Bovaird’s FB Page. Before I wrote about Kerry Kijewski we had talked via Skype for over 1 and a half hours. Since she is such an intelligent, articulate, sharp young woman our conversation flowed so effortlessly that time just got away from us. In addition to her blog (Her Headache) Kerry also recently started a travel website called The Insightful Wanderer whose major goal is to paint pictures with words. Kerry has been the subject of several articles where others have written about her. In one of my favorites, from the blog Change It Up Editing, titled Reading Challenges of a Visually Impaired Writer in the Digital World she talks very candidly about obstacles she encounters day-to-day in our technological environment. A genuine love for words, Kerry enjoys reading and writing. In her latest post on her blog, Human Rights Day 2014: Fragility, her frustration with the state of our world is tangible. When you visit the website Gateway to Blindness you will be met with a cornucopia of delightful stories, images and bursts of color your senses will come alive. Maribel Steel a talented writer, artist, speaker and one of the most positive people I’ve had the pleasure to meet has such a way of ever so eloquently stringing together words you will see the brighter side of life. In 8 Threads to Weave into the Garment of Change for example, in this post Maribel takes the sometimes uncomfortable subject of vision loss and disability, she interjects a little humor and positivity to remind us that we do have a choice in how we respond to life’s situations. In this article we are given concrete steps to follow to make it through to the other side of adversity. The topic of 8 Threads to Weave into the Garment of Change was so popular on Maribel’s blog earlier this year that since that time, she has expanded on the core message and now has over a dozen beautiful images to go with a 45 minute live presentation. As she will be promoting the presentation for 2015 her first live event was a week ago to a group of 175 sixteen year old girls at her old secondary college. Once again I want to thank Amy, Kerry and Maribel for their positive impact within our local and global communities as well. You are making a difference!! 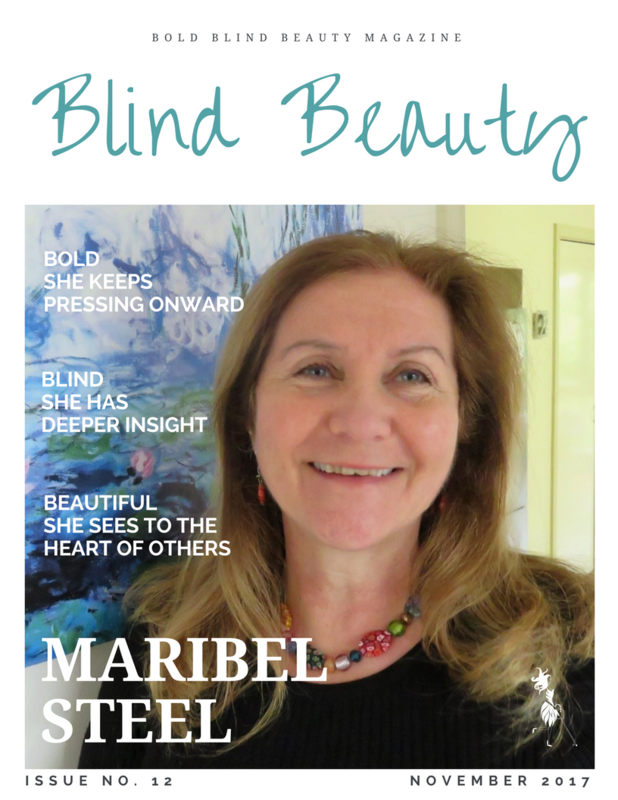 Reposted with permission from the author, Maribel Steel, today’s featured Bold Blind and Beautiful woman. When I began to lose my eyesight, it was natural to fear losing so many other aspects of my life that I treasured. Becoming an artist and failing to see colour was one of them. But the hardest hurdle to overcome was knowing how to weave positive threads into the garment with the label of disabled. Did you know that the dictionary defines disabled as: to make unable, weaken, destroy the capability of, to cripple, to have a lack of competent power or strength in either physical or mental abilities, to be disqualified and to make legally incapable: to be deprived of the right to engage and, lucky last, to be rendered unfit. No one had warned me about the sneaky tactics of Miss Puberty, the way she could change the life of a perfectly normal teenager when she brought an exclusive offer to our household. There she stood on the doorstep, bearing the garment of change, insisting I wear the new label of disabled. “Sign on the dotted line,” she said, holding out an invisible pen. Miss Puberty worked with such authority, there was no option but to agree to the hidden terms and conditions of a membership I didn’t want but had to accept. Over many years of trying to cut the cloth to suit my image, with the label of disabled firmly secured to the fabric of my life, it has taken 8 qualities to thread the garment I can now wear with pride. If you find yourself having to wear a particular label you consider quite unfashionable, let me introduce you to 8 colourful qualities essential to transform your dreary cloak of despair with chic threads of elegance. 1. Attitude is the key to accepting change in your life. Cultivate a positive attitude and be aware of the choices you are making. Often it is fear and self-pride holding back your progress. When you take control of your attitude in a positive way, you begin to infuse your life with possibility. Thread the colour RED into your new garment: it is the shade of glowing embers that will keep your fire alight. Don’t be afraid to gather around you a support team of loved ones, friends and colleagues and let them know how best they can assist you. In all truth, they really want to know how to co-operate in creating a balance in letting you take charge of your own life. Asking for help when you could honestly benefit from their genuine support is not a sign of personal weakness but can boost the morale of the entire team. With balance and flexibility, you reach your goals with team work. Thread the colour ORANGE into your new garment: it is the shade of joyful co-operation. Once you have accepted a different way of doing things, and have a circle of supportive friends who understand your unique needs, you can begin to commit to certain tasks you want to achieve. You can set creative patterns into the fabric of your life. You have renewed confidence, you muster a sense of inner strength that enables you to find creative solutions to the task at hand. With courage, you dare to persist when things go wrong. With a bold heart, you insist on finding solutions. Thread the colour YELLOW into your new garment: it is the shade of radiant sunlight, teaming with confidence, hope and good cheer. With any outcome you want to achieve, it requires a certain amount of focused effort. You may want to train to learn new skills, or adapt to a new way of doing familiar tasks. Effort, persistence, and tenacity can work together in shaping your reality by not giving up. Thread the colour GREEN into your new garment: be as tenacious as Mother Nature in her attention to detail, in her cycles of consistent renewal. Having woven the thread of acceptance, co-operation, commitment. courage and tenacity of spirit into the fabric of your life, you also can take brave steps toward reclaiming your independence. Again, this will require training, gathering of new skills but you can make choices that best suit your lifestyle. You may want to have a guide dog as your seeing eyes or prefer to use a white cane in getting around. Maybe it is time to gain skills in new technologies that can enhance your independence – it is totally your choice. This is an empowering place to be. It is a time to express your talents, and appreciate just how far you have come. Enjoy the sense of freedom as you stride out to conquer those daily challenges. Oh, and if by chance you find yourself falling into an embarrassing moment, as you will surely do, take along your sense of humour – it will get you out of any sticky situation! Thread the colour BLUE into your new garment: it is the colour of sky that will keep you boldly stepping onward over the horizon to meet your victories. In order to live confidently in a visual world when you are not equipped with sight, you will need a high level of organisation. Not only do you need to be more mindful of just about everything you do and where you last put things, your support team needs a friendly pep-talk to understand how important it is for you to move through their sighted world. It is full of unpredictable obstacles. Much mental effort is required in remembering every inch of your dwelling place – bringing order into the world of chaos is a matter of your survival and happiness. Thread the colour PURPLE into your new garment: it is the shade where two textures (of red and blue) combine to form one predictable strand. Intuition is your inner voice, a direct perception of truth independent of any reasoning. Most people find trusting intuition extremely difficult, especially when eyes and brain dominate our sense of reason. As a person with very little sight however, I have learned to reflect and listen to the wise internal voice. It requires patience, stillness and letting go of reason and rationality. Sometimes it is a call to rest and place our own judgements to one side. Thread the colour WHITE into your new garment: clarity of thought will become clear as you trust the pure guidance of your inner vision. You can touch your new garment of change, smell it, feel it, it has been skilfully woven by your life’s experiences thus far. It is your own designer garment fashioned from the threads of experience and skilled craftsmanship. Many threads are sewn into the fabric of your being, acceptance, co-operation, courage, tenacity, freedom, humour, patience, intuition,and trust. Maribel Steel is an author, writer, mentor and inspirational speaker living in Melbourne.